The council has teamed up with Warm Zones to offer free loft and cavity wall insulation to homeowners and private tenants across the borough. The scheme is part of a campaign to help residents reduce energy consumption in their homes, and benefit from cheaper fuel bills. 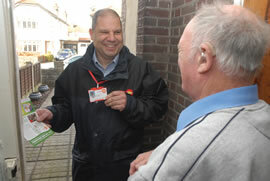 A team of assessors from Warm Zone are planning to visit homes in the Brentford area to carry out doorstep assessments. Residents will first receive a letter explaining what’s on offer. The assessors do not need to come into people’s homes, and will simply be asking some questions to work out how free insulation grants could benefit them. Cllr Steve Curran, cabinet member for housing and education at the council, said: “Insulating walls and lofts are some of the most important things you can do to conserve heat in your home. “With fuel bills now averaging nearly £1300 a year, this scheme will help people save energy, lower their fuel bills, as well as reduce carbon emissions. All the assessors carry Warm Zone identification, and if people are unsure, or have any questions they can contact Warm Zone directly on 0800 389 7286. The scheme is being run by Warm Zone until September and the insulation offer is available on a first come first served basis. Full loft insulation is free for homes that have 60mm or less of existing loft insulation. For homes that have more than 60mm of insulation there are discounts on top-ups.